System 7 Today Forums - Well, looks like I'm here to stay. So now that I have access to computers that run System 7 natively, I guess it's time to get to know you guys! Hi. I'm Yart, and I live in Canada, Ontario. I'm a completely new Mac user and I hope to learn lots about the classic Mac OSes during my stay here, now especially System 7. I like cats and drawing pictures in MS-Paint (being a Windows user all my life until recently). I also have an interest in programming video games. ...so anyone know if I could turn these bad boys into web servers? No ethernet and a stock Mac Classic is a very slow machine. So this would not be straightforward. It is, however, possible. There used to be 68000-based webservers "out there," but they have disappeared in recent years. One of the old ones actually ran from a floppy disk, and the site included images! It would be good to see one back, but I suspect that it would need to run through a bridge machine running one of two or three software gateways that were available for these purposes. It is not trivial, but it is possible and it would make an interesting project for the winter months. You should probably check out 68kmla.org , which is arguably going to be the best resource for how to go about this. Search the archives there for information. Also try http://homepage.mac.com/mhlewis/classic/index.html and, of course, the old stalwart http://www.jagshouse.com/ . 1) One of the two Macs died on me. There were some weird noises inside and when I turned it off, it refused to turn on again. Also the floppy drive didn't want to work. Is this a power supply issue? Can power supplies be switched? Unfortunately this one has the better monitor of the two systems and is the one I want to use as the image on the working Mac is warped and has a nasty scratch on the screen. 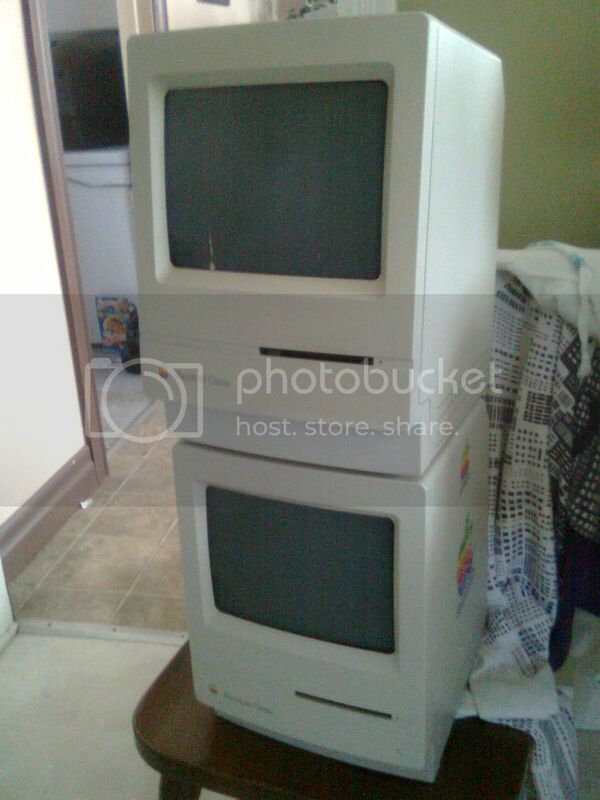 Could I move all the working components over to the other system that has the better CRT monitor? Make a "best" system out of the two and throw away the bad components. 2) Both Macs have a hard drive! I assume they're both 40MB drives (since that's what came with them), but can I pop in a bigger drive? I hear System 7 takes up around 40MB itself, so I'd like a bit of extra space. If not, is it possible to have both hard drives inside the same system? 3) Are there any ethernet adapters available for these? Does anyone know where I could find them if they exist? Softer high pitched sounds are often from capacitor failure.Louder very high pitched noises are often from the fly back transformer. Both of those items can be repaired or replaced. On that vintage of machine it is often easier and cheaper to get a working machine than to repair a broken one. System 7 requires no where near 40MB. I am not sure of the specific hard drive requirements, but disk usage for the system is more along the lines of 5MB-10MB. Bigger drives are not hard to find however. The internal is a 50pin SCSI drive. A couple different companies made ethernet adaptors for the external SCSI port. This page at Jag's House has a picture and information about a common model and its usage. 1) Cool. If it's fixable, I'll keep the one with the slightly distorted screen for the web server (since it would just sit there anyways) and fix up the good screen one (that also has a bad floppy drive I found out) for my own System 6-7 usage. The more I look into classic Mac OS, the more I'm falling in love with pre Mac OS X. So I'll get a friend who's handy with electronics to help me fix it. Do you know where I can get instructions to fix either of those problems? I can't seem to find any. 2) Oh alright cool. I'll probably look into a bigger drive down the road but if that's the case then 40MB will be fine for now. At least until I get enough content on the server to need expansion. 3) Cool. I got everything I need there to get started! Thanks a lot guys for taking the time to reply. You guys have been quite helpful and friendly, and that is great for someone completely new to Macs like me. I appreciate it. It sounds like one of the boards is bad and one of your CRTs is bad. So, just switch the working board and floppy drive into the good CRT one and you're set to go. Then, get an external enclosure for the extra 40MB drive and keep a backup of your server data in case one or the other of the drives dies on you. However, if they both came with a HDD originally, then they both have the rare(-ish) memory daughter card and should have came with stock 2 MB of RAM as opposed to 1MB. So, even if you opt to scrap rather than fix the bad board, be sure to grab the memory daughter card. Sorry, I can't be much help on finding 68000 server sofware.